On May 1, 1865, George Atzerodt made a full confession regarding the conspiracy to assassinate President Abraham Lincoln, a statement recorded by a detective working for Maryland Provost Marshal James McPhail. Strangely, this confession was never entered into the official records of the trial. Atzerodt told a much different story at that trial, one that closely conformed to the prosecution’s wild theories that five simultaneous assassinations had been planned. But this first confession was the one he expected to get himself off the hook with, because it was the truth. Only the truth is not what the military tribunal’s rush to judgment was concerned with. They were actually burying the truth, and tossing out Atzerodt’s initial confession was part of that plan. Atzerodt began by describing fellow conspirator Lewis Powell, known to him as James Wood or Mosby. This is the first mention of the “New York crowd” who return repeatedly as the rambling confession unfolds. Next, he identifies James Donaldson as one of the primary conspirators, a man who’ll disappear off the pages of history and never be heard from again. According to Don Thomas (The Reason Lincoln Had to Die), Donaldson (like Louis Weichmann) was a War Department informant placed inside the Confederate secret services. No problems here, as this is the designated crew of patsies. Mr. Thomas will never be investigated. Louis Weichmann appears, although Atzerodt has no clue Weichmann is a War Department snitch. Atzerodt goes on to explain his mysterious presence at the Kirkwood: He was sent there to collect a pass for travel to Richmond from Vice President Johnson, which is the same reason Booth will stop by the Kirkwood and inquire after Johnson on the day of the assassination. (Later, this story will shift to Atzerodt being there to murder the Vice President.) The confession goes on to incriminate Charles Yates, Thos. Holborn, as well three referred to as Bailey, Barnes and Boyle. 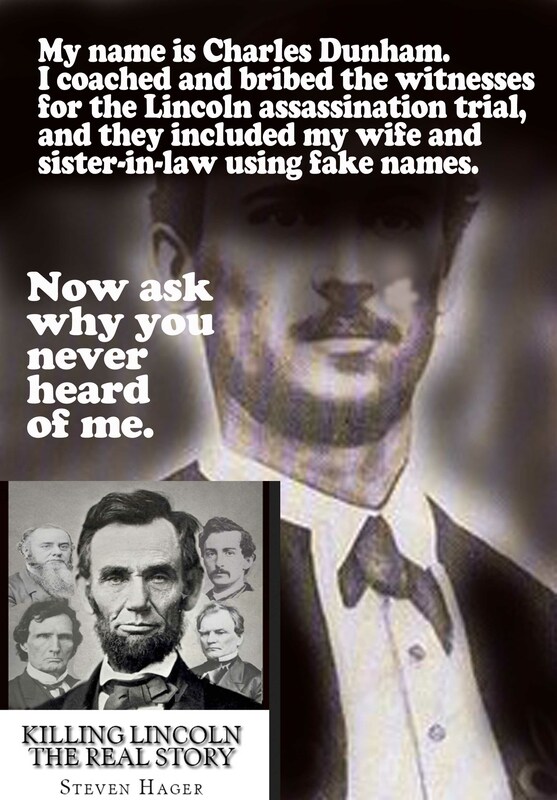 But the most interesting name was that of a female who obviously had a close relationship with Booth and appeared just a few weeks before Lincoln was murdered. Here’s a character worthy of investigation. If you know anything about spooks, it’s that 20-something super hotties play a significant role in operations and are known as “honey traps.” Why was Kate never charged or called to testify since Atzerodt clearly places her in the center of the conspiracy, along with an entity he only identifies as the “New York crowd?” It wasn’t because nobody looked, but that she simply never could be found. Some say her real name was Sarah Gilbert Slater, a Confederate spy who disappeared without a trace. Since her name appeared frequently in two trials, investigators did look for her extensively, but since she wore a heavy veil at all times and changed names constantly, and was known mostly as “the french woman,” they really didn’t have much to go on. In 1865, while being interviewed in Richmond for a passport to travel to New York City to see her mother, Slater was recruited as a spy by Secretary of War James A. Seddon and became a courier for messages between Richmond and Confederate operations in Canada. A large amount of money allegedly disappeared with her, as did her two brothers around the same time. Whether they were all mysteriously murdered over their knowledge of the conspiracy, or whether they created new identities in France will never be known. However, Thomas has proposed an alternative theory, which is the mysterious French woman is Kate Warne, the first female detective hired by Allen Pinkerton, who died in 1868 with Pinkerton at her side. Somehow, I doubt this is true. My guess is Kate was Sarah and she was turned by the “New York crowd.” A spook with her assets would have been extremely useful to any side, and any corporation, and in the real world of spooks, loyalty usually falls to the highest bidder, or the one who can keep you off the gallows, and not the one with the best dogmas. Don’t feel bad for John Wilkes Booth—he was a great actor, and a great spook, no matter what the history books say. He was also the first real matinee idol whose presence on the streets of Washington or Richmond caused some women to swoon. Had the Confederates won the war, and Booth escaped, he might have become President. It astounds me how spook assassins like James Bond are so celebrated by our culture, yet when a real life Bond appears before us, only his faults are celebrated. Booth’s intelligence is evidenced by the complexity of his plots. He wasn’t sure which theater Lincoln might visit that night (there were two options), so he purchased the box next to the Presidential box in one, while drilling a peep hole and fashioning a door wedge for the other. But even then, he didn’t purchase that box in his own name, but sent the manager of the billiard parlor he frequented to purchase the tickets. Booth was raining money right before the assassination, and gave a wad to George “Dirty Andy” Atzerodt to get an expensive room at the Kirkwood. He also purchased four colt pistols and rented four fast horses. There had to be a benefactor, because a few weeks earlier, when the kidnapping plot was still being fomented, Booth had been crying poor and seeking additional funding. He had a bank account in the same Canadian bank used by the Confederate Secret Service so any funds he received from Richmond would have been transferred through this bank. If Booth had spent less time on spook activities and more time on acting and earning a living, he was capable of manifesting an upper-class salary. But running spook operations required budget, and the bigger the plans, the bigger the budget. Bill O’Reilly takes the obvious road and paints Booth as demented like most biographers, but that’s just one of many inaccuracies. O’Reilly falls into a few rabbit holes, and fails to pinpoint the center of gravity on the assassination. Here’s how Booth looked at 18, sans mustache. Because he died without the mustache, I prefer to think of him this way. When he died, Booth already knew his bid for glory had been dashed. Even the Copperhead press was aghast and had turned on him. Not to mention, his letter of explanation had strangely never been published, and Booth was checking the papers every day. Booth frantically began writing a diary to explain his position. Too bad we never saw it. Booth sometimes gets painted as a serial liar, but when you’re a spook, that just comes with the territory. If Booth said he was going to New York, he might have been going to Richmond, and if he said he was going to Richmond, he might have been going to Canada. He seldom told the truth about anything and spread lies and disinformation with great frequency. This was not done out of insanity, but to shield operations. One of his favorite tricks was to pick up a horse at one stable, and then check the animal into another stable on the other side of town. This would give him an air-tight alibi, as he could claim he’d been out riding in the country and not in Washington during the allotted time. The movies show him leaping to the stage, brandishing a bloody knife and shouting Sic Semper Tyrannis, but, in fact, eyewitnesses claim he jumped and instantly disappeared through the scenery, while mumbling “I did it!” under his breath. Booth had shouted Sic Semper Tyrannis, but that was when he was firing the derringer, and the shout mostly lost in the explosion. According to diary fragments that survived the vetting process, Booth broke his leg during a fall on his horse later that night, and not when he’d jumped to the stage. Booth did not make a grandstand display of himself on the stage like a demented psycho killer. He also lost his hat when he’d jumped, but in typical Booth fashion, had packed a spare in his saddle bag. He always seemed to think of everything that could go wrong and plan accordingly. Booth waited on the other side of Navy Yard Bridge for his three accomplices to catch up, but only one appeared, David Herold, the weakest of the lot. This must have been a surprise and disappointment because the band of brothers had suddenly shrunk in half. Herold likely bolted when the nurse at William Seward’s house had screamed bloody murder out a third-floor window. If so, it meant he’d abandoned Lewis Powell, who didn’t know his way around town. And that would be the reason Powell got nabbed. 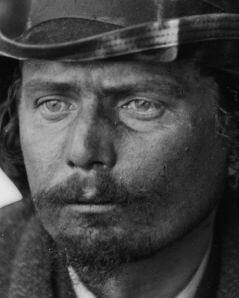 With no place to go and his horse gone, Powell wandered over to Mary Surratt’s boarding house at 3 AM. But soldiers arrived there a mere four hours after the assassination. In fact, that was the first place they went to look for the assassins, even before investigating Booth’s hotel room. Had Powell not shown up there that night, Surratt likely would never have swung from the gallows. The fourth rider who didn’t show should have been Dirty Andy, but he’d bailed the second he’d heard “assassination” and not “kidnap.” Booth entrusted Andy with his Canadian bankbook and maps of the Southern States. Andy was supposed to pick up a pass so they could travel through lines to Richmond under the guise of opening a theater there. When he was first picked up, Andy spilled the beans on everything he knew, but that confession was never entered into the trial and the original was destroyed. Meanwhile, Andy was forced to wear a suffocating hood night and day and went crazy and was soon willing to admit to any scenario presented before him. Soon he was confessing to having been told to kill the Vice President. In truth, Booth never would have depended on Dirty Andy to assassinate anyone. Rowing his boat across the Potomac south of town, on the other hand, was Andy’s real role. The invented assassination gave Stanton the idea of inventing even more assassinations because two others would soon be charged for other imaginary assassinations, one for Stanton and one for General Grant, and all three of these imaginary assassins would soon be found guilty, although only Dirty Andy was hanged. It was a veritable Valentine’s day massacre of political bigwigs held on Good Friday, but it was all a hoodwink designed to hang scapegoats as quick as possible. Meanwhile, the case against Andrew Johnson as the mastermind of Lincoln’s assassination was put on back burner. That card would be held close to the vest and played later on, during Johnson’s impeachment trial.